The tower light can display up to five colors—plus an audible alarm module—in one tower, which allows for multiple colors to be lit simultaneously. The loud 92 dB adjustable alarm offers four user-selectable tones, including pulsed, chirp, siren or continuous. For optimal performance, each light segment can be selected solid ON or flashing, and appears gray when off to eliminate false indication from ambient light. 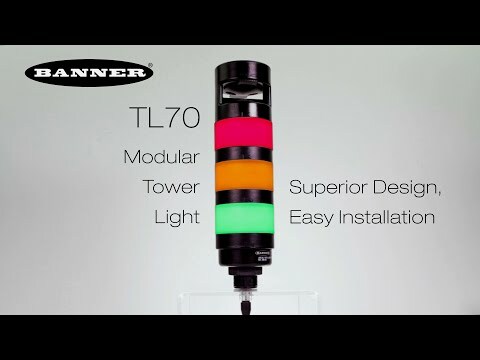 Banner’s TL70 modular tower light is available as modular segments, allowing users to build a custom device. For user-friendly installation, the TL70 is up and running in just three easy steps, which include assigning the module settings, assembling the device and applying power. The TL70 is also available as a preassembled configuration. For use in harsh environments, the TL70 modular tower light features rugged, water-resistant IP65 housing with UV stabilized material. Housing is available in black or gray, which allows users to match the device to their application.